Recipe for a simple Capsicum Pepper Fry, Kudaimilagai Milagu Kari. 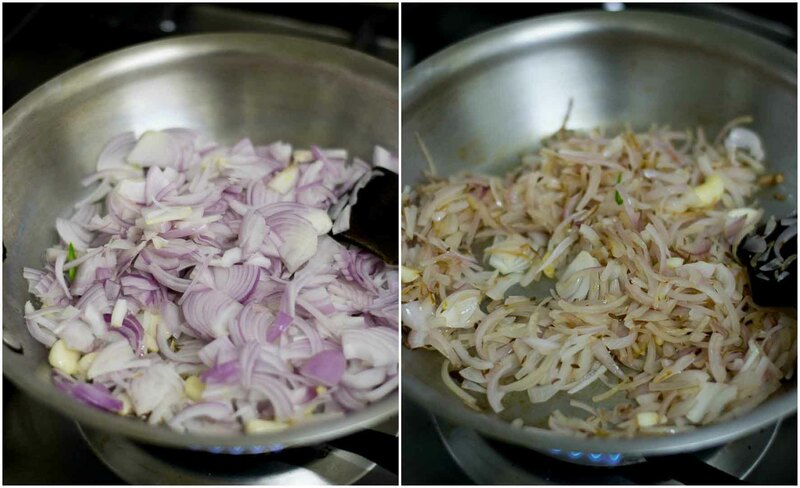 Perfect accompaniment with roti, chapati or rice. Recipe with step by step pictures. This recipe is a very simple everyday dish that can be put together in under 15-20 minutes and spiced mainly with black pepper. The flavor of black pepper along with capsicum is what makes this dish come alive. Its a very healthy stir-fry. So try it at home. 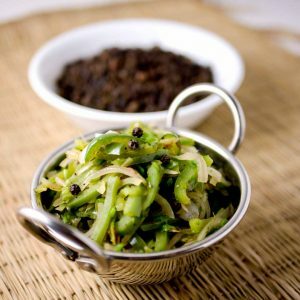 Black Pepper is a very important ingredient in Tamil cuisine. The history on pepper is pretty amazing. Pepper is called as milagu மிளகு and red chillies are called as milagai மிளகாய். 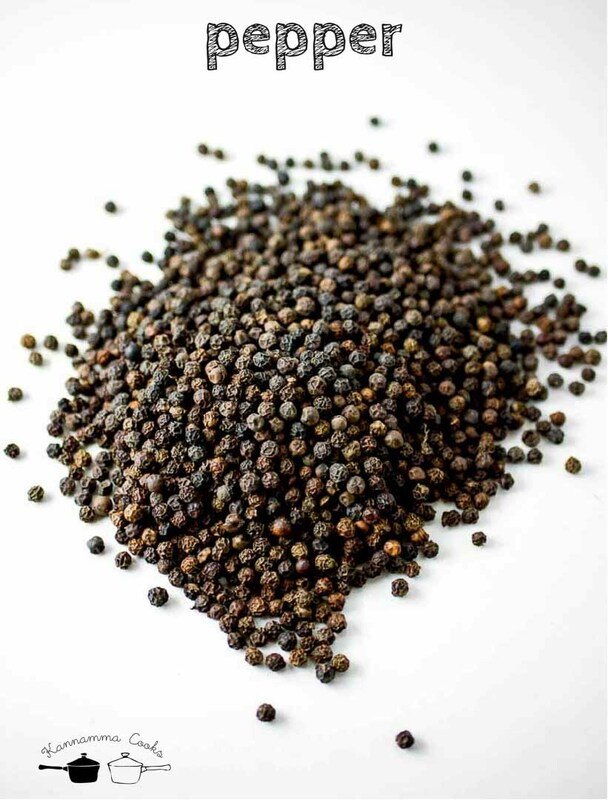 Until the 15th century, the south had black pepper only. Pepper was a very important part of foreign trade and used extensively as medicine. It was often referred to as black gold and was used as a commodity money / barter. When the chillies were introduced then, they did not know what to call them. So they called it milagai – milagu maadiri – milaguvai nenuchukonga (literally meaning “just like black pepper”). So that’s how the the word milagai for chillies came into being. There is one more thing! We always say vegetables as KaiKari. Pepper was also called as Karunkari. It just means black. Vegetables was always cooked with kari (pepper). Even today we say “kaikari samachaacha” – which means “have you cooked vegetables today?”. Sadly the kari part does not refer to black pepper anymore. As meat dishes were always prepared with pepper, the word kari started referring to meat and kari these days means meat….. 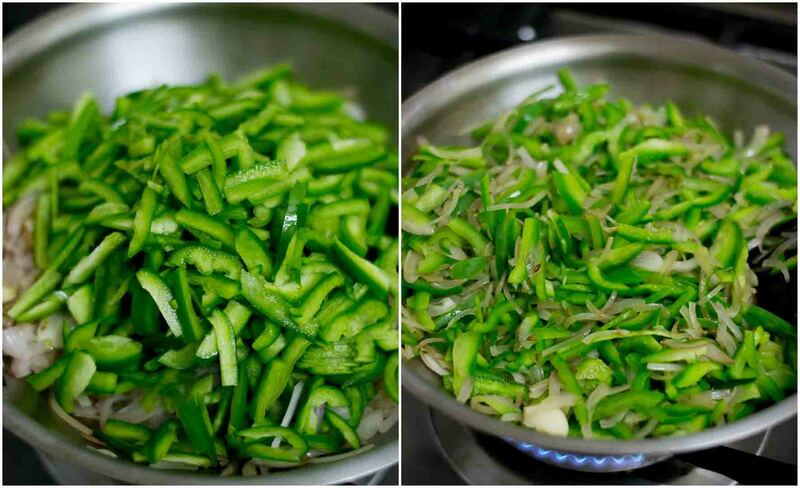 Here is how to do a very simple Capsicum Pepper Fry. 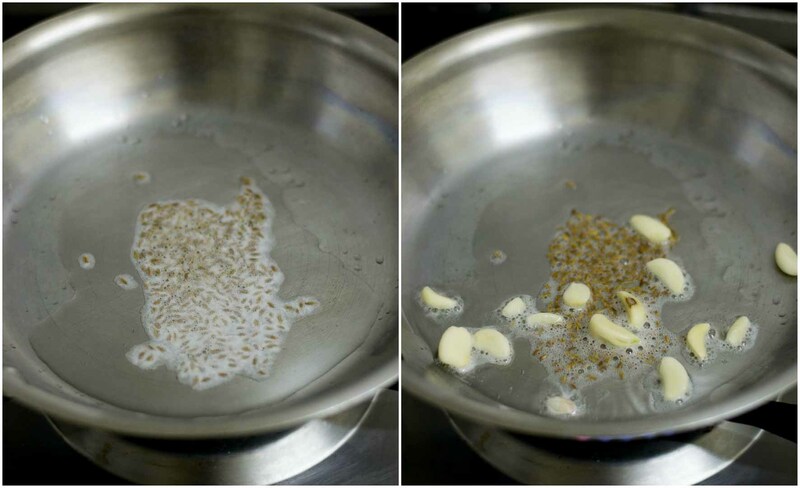 Heat coconut oil or gingely oil (Indian sesame oil) in a pan and add in the cumin seeds and few cloves of garlic. Add in the sliced onions. Saute for 3-4 minutes until the onions are soft. Add in the sliced capsicum and saute for 3-4 minutes. I like the capsicum to have a crunch. So I do not cook for long. Cook until the texture that you like. 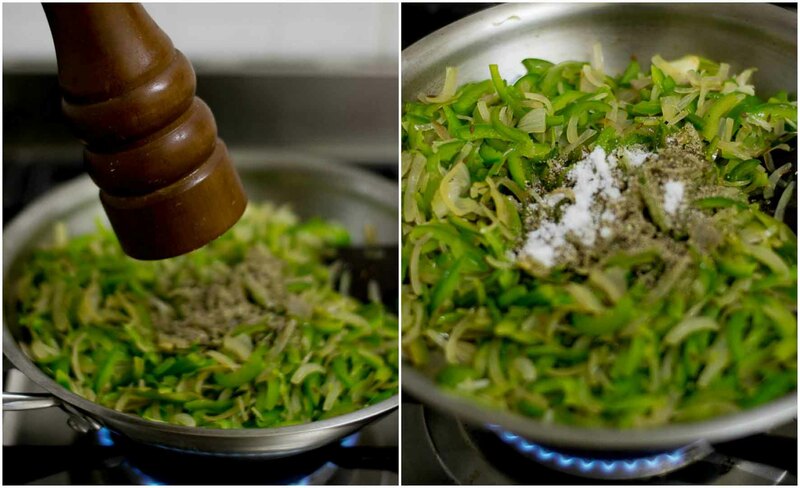 One can also use colored variety like red or yellow capsicum and that works well too in this recipe! Add in a lot of black pepper and salt. The aroma and flavour of fresh cracked black pepper is divine. Try to use freshly cracked black pepper if possible. Note: I do not like to add salt at the beginning of cooking for this recipe (I usually add in the beginning) as the veggies become soft and loses its crunch. So for this recipe, always add salt at the end of cooking. 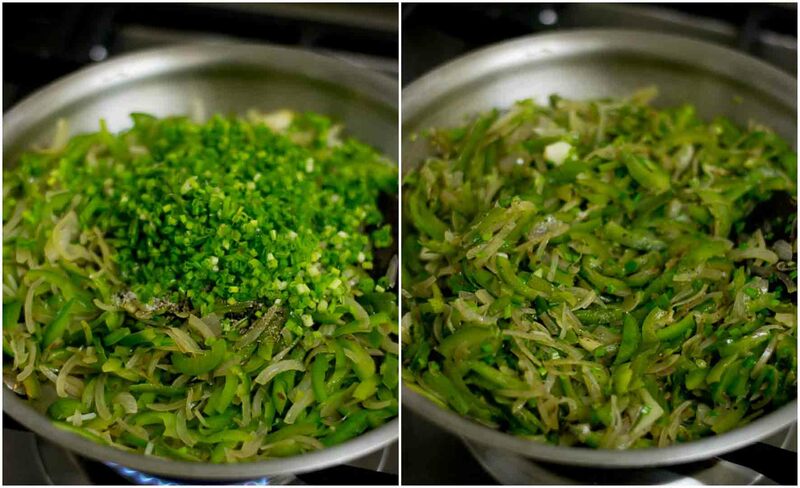 Add in the spring onions and mix well. Remove from heat. Serve hot! Add in the sliced capsicum and saute for 3-4 minutes. Add in black pepper and salt. I loved what you wrote in the beginning of the post. 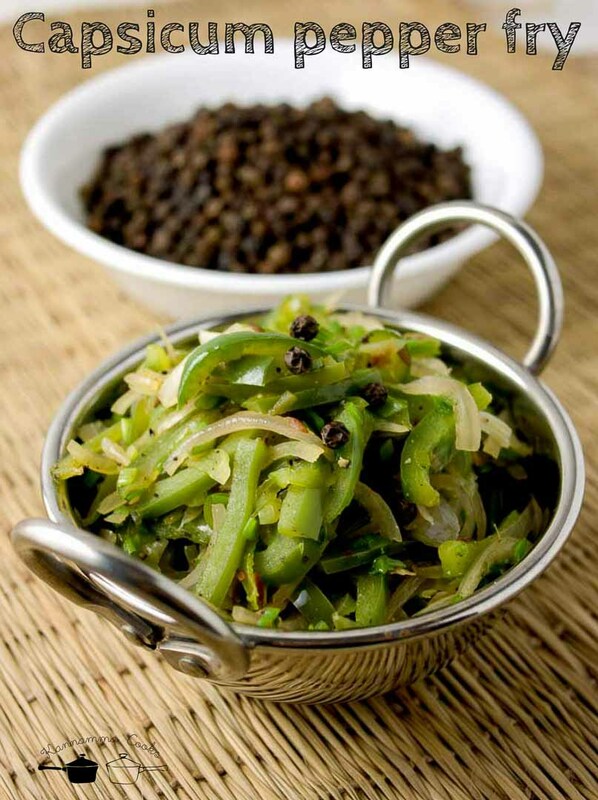 A little history of pepper and the status pepper had in Tamil cuisine. I love Tamil food and Tamil culture. Thanks for sharing such wonderful details.